The Romance Dish: Aunt Dimity Dazzles! It's a while since I talked about a mystery series here - and I've got a beauty for you today. As many of you know, I've picked up so many recommendations for great books from the regulars here at the Dishes. 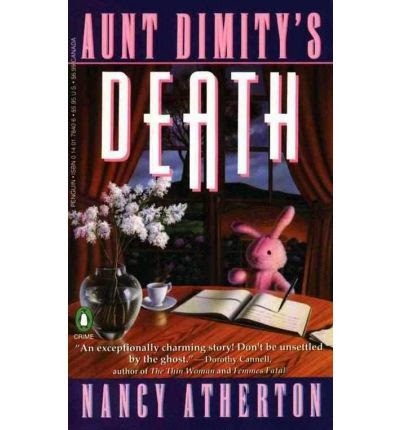 A few months ago, Janga mentioned a cozy mystery series by Nancy Atherton based around a ghost called Aunt Dimity. As a diehard ghost story fan, this sounded right up my alley, so I ordered the first one. I've since read 10! That's probably enough to indicate that I really enjoy these and I'd recommend them highly! These books are so cozy, they practically make you hot chocolate and knit you socks. Seriously! Even the bad guys aren't particularly bad and if you're a devotee of blood and guts and loving descriptions of people eviscerating one another, these aren't for you. However, if you love charming characters, romantic subplots, chocolate box England (I hate to admit it, but I'm a sucker for chocolate box England! 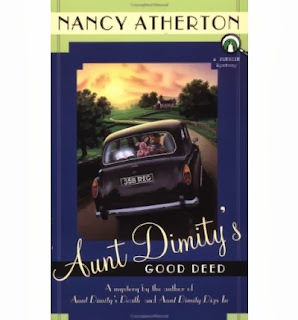 ), lovely humor and an affirmation of the good things in life, I'd strongly advise picking up an Aunt Dimity mystery after you've made yourself a pot of tea. For these books, coffee just doesn't cut the mustard. And if you can manage an Eccles cake or a cucumber sandwich with that tea, you're right in the ballpark! I've had the sort of year where every time I knock one task on the head, another hundred spring up to taunt me. In that sort of stressed frame of mind, these comforting, warm-hearted, positive books are just the ticket. They're short - about the length of a category romance - and like a good romance, you just know everything is going to turn out right in the end. One proviso, I'd recommend reading the books in order. The cast of characters grows like Topsy so it's nice to see the relationships develop from book to book. The first book AUNT DIMITY'S DEATH introduces the series' major character. American antiquarian book expert Lori Shepherd has just lost her beloved mother when she discovers that the Aunt Dimity who featured in childhood stories was a real Englishwoman who has left her a fortune. I adored this story about second chances and the power of love and making reparations for old tragedies. There's also a lovely romance for Lori and we come to love Dimity who manifests through a blue journal and her various stuffed animal cohorts (told you this was on the sweet end of things, didn't I?). I found this a really moving story, despite all the humor and the happy ending. In the last chapter, I was crying like a drainpipe in a downpour. The second book is actually my favorite in the series - which is odd because it's not very much like the others. So far nine out of the ten books have been told from Lori's point of view in first person. 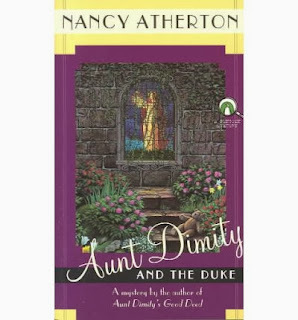 AUNT DIMITY AND THE DUKE is a third person romance featuring lonely computer whizz Emma Porter, aided by Aunt Dimity and some stunning Cornish scenery. I particularly loved the characters in this one and most of them turn up as regulars in future stories. The third book, AUNT DIMITY'S GOOD DEED, returns to the pattern of the first. Lori tells the story - and has a fairly innocent flirtation with a handsome man while she's disgruntled about the state of her marriage (don't worry - everything works out right in the end!). Lori's flirtations become a constant - it's like having a romantic plot while not having one, if you know what I mean. And all the books include romantic plots for secondary characters. Weddings reign supreme in Aunt Dimity World! 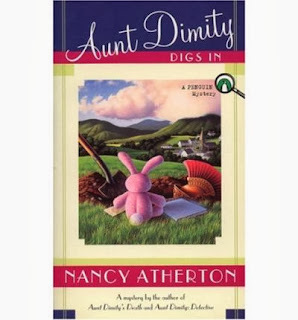 Book 4, AUNT DIMITY DIGS IN, features an archeological setting - I love those so this one really made me smile. There's also a wonderful message about overcoming prejudice and the bitterness of the past. By this stage of the series, we have well established principal characters, a fun ghost, a fun pink rabbit avatar, and a wonderful English village full of eccentrics who come and go in the stories. Also by this stage, I was well and truly hooked. I'm writing this review a couple of months ahead of time, but my addiction to the series is ongoing. I have three more waiting for me as part of my Christmas reading binge. These lovely books with their message of love conquering all and forgiveness for past wrongs are just the things for the Holiday season! So do you like mysteries? Do you like yours sweet and smiling or hard-edged and scary? Any favorite mysteries for me to read once I get to the end of the Aunt Dimitys? Hi, Anna! Haven't chatted with you in ages. Hope you're doing well. I love all kinds of mysteries plus other genres as well. I really enjoy Rhys Bowen's Royal Spyness series. In addition, cozy mysteries are tops. Author Lucy Burdette writes food-related cozy mysteries that take place in Key West Florida. I recently read her book, "Murder With Ganache" and found it to be really good. For anyone who likes Key West, these books are a must. I've also read "The Vanishing" by Wendy Webb and "The Winter People" by Jennifer McMahon and found those to be terrific edge-of-the-seat stories. For those readers that like cozy mysteries, I have found that the website, www.killercharacters.com is a good way to keep up with the latest ones. Since I "cut my teeth" on Nancy Drew mysteries, that genre will always be a favorite with me! Hi Connie! Lovely to see you here. Thanks for all your recommendations. I can see that my TBR pile will be growing. And I hadn't heard of that cozy mystery website either - will definitely be checking this out. I read a lot of mysteries in my 20s but just drifted away from the genre somehow. Definitely back into it big time now! Anna, the second book is my favorite in the series too, although the first one and Aunt Dimity's Christmas are close seconds. Number 19, Aunt Dimity and the Wishing Well, will be released next month, and I eagerly await it. If you like ghost mysteries with humor, you might like Carolyn Hart's Bailey Ruth Raeburn series--although Bailey Ruth is not exactly a ghost and not exactly an angel but somewhere in between. Have you read Dorothy Cannel's Ellie Haskell series? That's another of my favorites. Like Atherton, Cannell gives her readers a rich mix of humor and wonderfully memorable characters along with the mystery. AD and the Family Tree which I loved. Thank you so much for recommending these books to me - in the words of the classics, I've had hours of fun and pleasure out of them. And I've passed the f and p on to my friends who have all become diehard fans. I haven't read either of those authors you mention - off to the Book Depository with me! I'm reading Karen Rose's reomantic series. The first is Don't Tell. They are meant to be read in order. The book's characters are in the same "universe" You can check the author's web sites for order, etc. I am so glad I bought them all at the same time. There are 13 or 14, I believe. Scary but really good with hot romance in each one. JCP, those sound great. I've seen Karen Rose's books around the place and they look great. I must grab one and read it! You kinda had me at hot romance! Deb, I'm like you - I love a mystery with a twinkle in its eye. Have you read the Daisy Dalrymple books by Carola Dunn? That's another really charming series. I'd love to know what you think of the AD books when you read them - I hope you have fun with them. I sure did! I enjoy any kind of mysteries but probably pick the dark and scary first lol. I just started reading Nora Roberts and she has quite a few and I've loved them all so far. I started out reading all those gothics - some of the best mysteries around. Catslady, as you know, I'm a huge Victoria Holt fan from way back so I hear you on the gothics. Recently I read Nora's The Witness and really enjoyed that - worth checking out if you haven't read it. I think the great Nora writes a great mystery novel! Hello everyone! Anna is staying with me and having computer problems. Stay tuned! Thanks, Keziah! Took a bit of fiddling but I'm HERE!!!! Hi Anna! I like mysteries too. The type I enjoy depends on my mood. I recently read Carey Baldwin's CONFESSION which is a psychological thriller. Kept me glued to the pages! I also like cozy mysteries like Kate Carlisle and Julie Hyzy. Sorry I haven't been around today. I'm out of town and internet is spotty. PJ, sounds like we're both playing away. I had the Australian Romance Readers Association Awards dinner on Saturday night in Sydney and have stayed over a few days to catch up with people. Having fun! I haven't heard of Carey Baldwin. Must check her out. Have you tried The No. 1 Ladies' Detective Agency? Sure, it takes place in Botswana and not England, but it has a similar cozy feel. Sheree, I've heard great things about that series. I've read one of the Scotland Street books (not mystery) by the same author and I enjoyed that. Andrea, I remember devouring the Nancy Drew books when I was a kid and loving them. Same with the Trixie Beldens, although I have to say my faves were the Enid Blyton mysteries. Hope your daughter enjoys the NDs - and definitely check out Aunt Dimity! I enjoy all types of mysteries. I'm not a big fan of the blood and guts style. I do enjoy books by Iris Johansen, Lisa Gardner, and Linda Fairstein among others. They are far from cozy mysteries. The Goldy Bear Culinary Mystery series by Diane Mott Davidson Is a bit closer to the cozy mystery style and enjoyable. Another series and author I enjoy is the Rev. Clare Fergusson & Russ Van Alstyne Mysteries by Julia Spencer-Fleming. An interesting twist to the normal couple and well written. This is also a series that really should be read in order because of the way the relationship develops. If I am short of time, there are many Harlequin Intrigue authors I enjoy. Several have ongoing series with recurring characters. Debra Webb's Colby Agency series and spin-offs are long running and enjoyable. I really haven't read many category cozy mystery series. 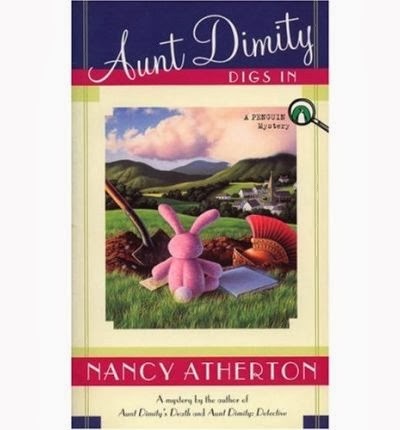 The Aunt Dimity series sounds like an enjoyable way to spend an afternoon of reading. I enjoy a good mystery, but to be satisfying, it doesn't need to be dark and frightening. Miss Marple and Jessica Fletcher of Murder She Wrote had good murder mysteries without making us cringe reading the story. Hopefully, it won't be too hard to find the first books in the series. I'll warm up my teapot and get ready. I love eccles cakes, but the nearest bakery that has them is over an hour away. I'll just tell my husband I need them to read the stories, and stock up on them (hiding them from him so I actually get some). Thanks for introducing us to Aunt Dimity. Pat, like you I'm not particularly into descriptions of too much violence - cozies suit me fine, actually! Just enough blood to make it interesting, LOL! Thanks for the recommendations. I remember loving some of the older Iris J romances so I suspect her mysteries would be right up my alley. I hadn't heard about the Golden Bear books. I must check them out. I so agree with you about the Julia Spencer Fleming books - I discovered them here, I think Janga recommended them to me and I've become a huge fan. Another series I've enjoyed are the Bruno Chief of Police Books by Martin Walker. They're about a French policeman in a beautiful part of rural France, not too violent, and the descriptions of food are just mouthwatering. Sounds like Aunt Dimity is just right for you. Let me know how you go with them. All but one are still very easy to get (it's well into the series and I'm holding out hope for a reprint!). And I hope you get your eccles cake! Thanks so much for a really enjoyable day here with the Dishes! Thanks as ever to PJ and Andrea for hosting my ramblings. I was so hoping you guys would give me some more recommendations and you did in stacks, which is fantastic! See you next month!